Most of the oxygen in the corporate sustainability space tends to be sucked up by the largest companies in the marketplace. To a certain extent this makes sense, as they have the greatest individual impact, face sizeable levels of public scrutiny and have substantial resources to devote towards efforts like expanding corporate social responsibility disclosure practices and auditing their supply chains. This also has its drawbacks, as it takes the focus off not-so-large companies. A business wasting electricity due to a poorly insulated office leads to negative consequences no matter the size – increased costs, wasted energy and an expansion of its carbon footprint. 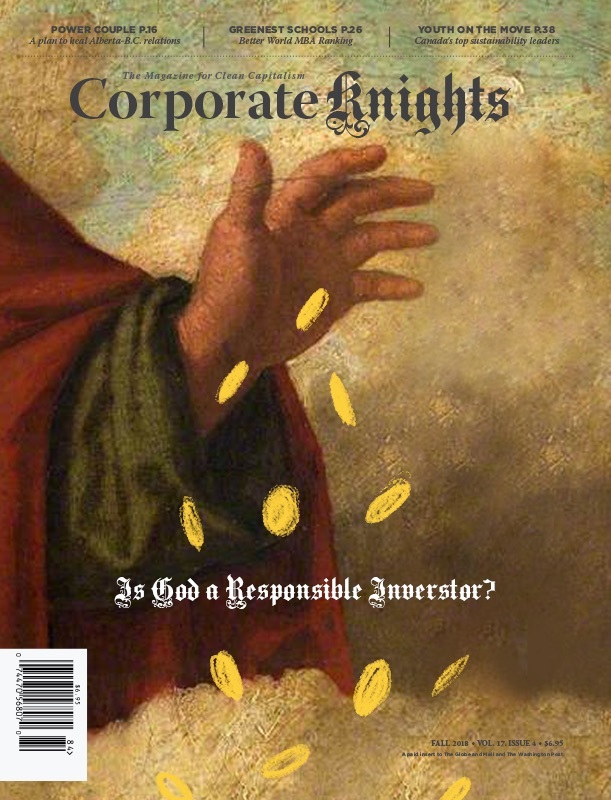 Corporate Knights continues to focus on the big corporate fish through our annual Best 50 Corporate Citizens in Canada, which targets companies with revenues of $2 billion or more and at least 2,000 employees. But starting in 2014, we also began to rank Canadian companies that fall under that threshold in a separate ranking known as the Future 40. Over these past three years, we’ve observed a dramatic increase in transparency and disclosure practices at many leading medium-sized Canadian enterprises. This trend is particularly pronounced when it comes to resource productivity indicators. This year, 90 per cent of companies on the Future 40 disclosed their energy consumption compared to 78 per cent in 2014. An impressive 90 per cent reported their carbon emissions versus 82 per cent in 2014. The improvement is even more recognizable when it comes to the water and waste indicators. Corporations reporting water consumption jumped to 75 per cent, compared to 48 per cent two years prior; and 70 per cent reported how much waste they generated versus 43 per cent in 2014. What many medium-sized companies are beginning to realize is that sustainability is not an expensive luxury only available to the largest companies, but an integral part of staying competitive in today’s marketplace. Perhaps more notably, disclosure has remained strong in both the energy and mining sectors despite the challenges brought on by the current period of low commodity prices. “It’s very encouraging to see companies in sectors facing strong fiscal headwinds deciding to maintain the scope of their sustainability reporting,” says Michael Yow, director of research at Corporate Knights. Following Horizon in the ranking is the Greater Toronto Airports Authority, followed closely by Export Development Canada. Both companies have won the Future 40 ranking in previous years. With a turnover rate of 22.5 per cent, a number of new companies also joined the list in 2016. These include the utilities London Hydro and EPCOR Utilities, as well as Edmonton International Airport and paper company Tembec. There are several indicators in which smaller Canadian companies in the Future 40 outperform their larger peers on the Best 50 ranking, including maintaining a lower CEO to average worker pay ratio. Elsewhere, however, smaller companies are struggling to keep up. Future 40 companies are failing to invest in the same percentages of research and development as their larger industry rivals. Non-profit organizations like Mitacs are working to bridge this void by helping to build partnerships between academia and industry to spur further innovation, particularly among smaller enterprises (see here). Once Ontario and Alberta implement their plans, 80 per cent of the country’s population will find itself under some form of carbon pricing. In addition, the federal government is signalling its interest in a national minimum on carbon pricing as a first of many steps towards reaching its aggressive post-Paris conference carbon reduction goals. This presents both a threat and an opportunity for Canada’s business community. These Future 40 companies are among the best positioned to take advantage of it.